When most people hear that their dental conditions can be treated with lasers, they naturally have a few questions. Although using a laser to zap away infected tissue and eradicate cavities might sound like something out of a science fiction movie, lasers have been used in dentistry since 1994. Here are just a few of the ways laser dentistry is used at Dental Excellence to improve your experience. One of the things that most patients dislike about getting dental fillings is the drilling to remove decayed portions of the tooth. In addition to feeling the vibration of the drill, many patients struggle with the smell and dust associated with drilling. However, lasers have transformed cavity removal. These lasers work by heating the water molecules present in the decayed portion of the cavity, forcing the damaged section to expand and dislodge from the rest of the tooth. In addition to preventing the kind of micro-fractures that traditional dental drilling can cause, laser-assisted cavity removal is fast, dust-free, and relatively painless. In fact, many patients who undergo laser cavity removal don't even require anesthetic, making this method perfect for children and people with severe medication allergies. 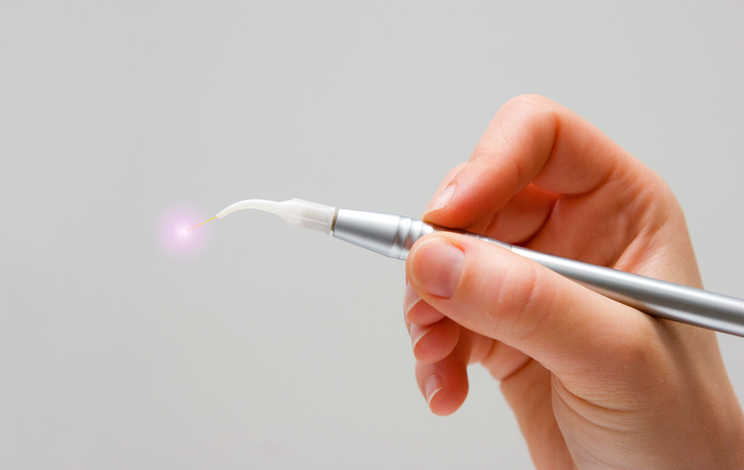 Dental lasers can also be used to reshape gum tissue. Since the gums frame the teeth, an uneven gum line can make some teeth look smaller, larger, or less shapely than they actually are. Gum contouring helps our dentists to quickly, efficiently, and gently reshape your gum tissue to improve the look of your smile. If you are interested in learning more about laser dentistry, make an appointment with one of our dentists today. We'll be happy to show you what dental lasers can do for your smile.